In your first official communication to guests, give a striking preview of your wedding locale with Oregon-inspired save-the-date cards. 1. IN THE WOODS: Southeast Portland–based Toast creates custom save-the-date stickers from real wood. Upload your own artwork, or work with Toast’s designers to dial in your design for maximum impact. Prices start at $3/sticker with a minimum order of 50 pieces. 2. MOUNTAIN MAJESTY: This custom save the date from Maggie Murray Creative in Pleasant Hill features the Three Sisters mountains in silhouette and pairs watercolor details with gold calligraphy for an elegant preview of an adventure-themed wedding. Pricing for custom designs available upon request. 3. 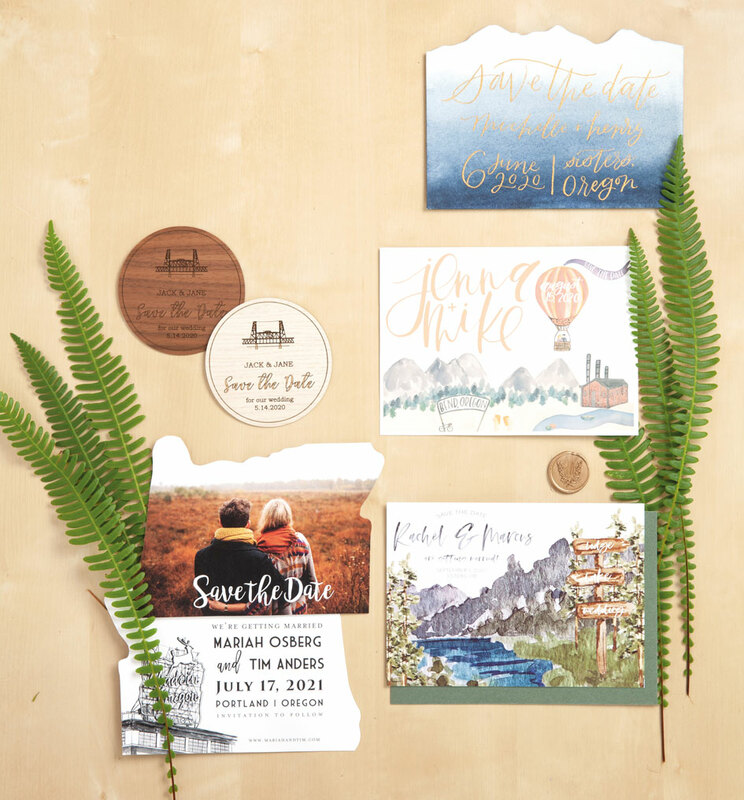 SUMMER SCENE: “This save the date is inspired by the magical summers in Bend. The scene overlooks the Deschutes River near the historic Old Mill. The hot-air balloon is a nod to a favorite summer event, Balloons Over Bend. And no scene of Bend would be complete without beer and bikes,” says designer Casey Lamont of My Fair Letters in Bend. Custom illustrations for save the dates start at $250. 4. RIVERSIDE REVEL: A central Oregon scene rendered in watercolor by Portland-based Meyer and Market stirs excitement ahead of a rustic, outdoor wedding. Custom wedding suites start at $350. 5. GREAT STATE: Custom die-cut cards in the shape of the state of Oregon are perfect for greeting out-of-town guests or celebrating your love for the PNW. This style, by Northeast Portland–based Crave Design, can be personalized with a photo and custom artwork; shown here is that style of card bearing an illustration of Portland’s iconic White Stag sign. Die-cut save the dates are $4 each and include envelopes with printed return addresses.